CorShield VpCI Transit Coating is a water-reducible concentrate designed as a complete replacement for oil-based corrosion preventives. 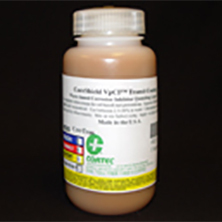 CorShield VpCI Transit Coating forms emulsion in water and is applied to metal surfaces by spraying or dipping. The wide dilution range with water allows flexibility to customize the length of protection required vs. applied cost. The protective coating is also translucent and in ambient conditions becomes dry-to-touch 30 minutes from application. CorShield VpCI Transit Coating is designed to be removed with Cortec VpCI-414 or other conventional alkaline cleaners. CorShield VpCI Transit Coating is designed to protect ferrous and non-ferrous metals in sheltered areas, indoors, or in packaging with no direct exposure to rain or outdoor elements. Available in 5 gallon pails (Cortec Product # 12303103) or 55 gallon drums (Cortec Product # 12303104). 5 gallon drum weighs 50 pounds and ships under our standard shipping rates. The 55 gallon drum must be shipped by truck. We will provide you with a freight quote before we ship this product. The product should be stored sealed in a heated warehouse to avoid freezing. The product has a shelf life of 24 months.